If you're replacing a steam boiler, there's only one right way to size that boiler, and that's to measure the radiators. If you're replacing a hot-water boiler, you'll do a heat-loss calculation on the building as it is today, but it also pays to measure the radiation to see if you can reduce the water's temperature and save fuel. 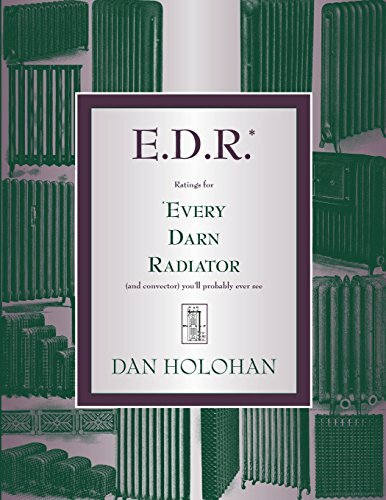 The challenge, though, is that it's often difficult to find the ratings for many of those old radiators and convectors, and that's why I compiled this book. I've been saving heating books and heating-manufacturers' literature since 1970. I have a lot of this stuff. E.D.R. is 272 pages of nothing but radiator and convector ratings and if that old unit is out there in the field, it's probably also in this book. This is a terrific resource for any heating professional who wants to get it right the first time.